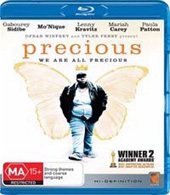 The full title of Lee Daniels’ film is Precious: Based on the Novel “Push” by Sapphire. Though released in Australia in 2010, it was made in 2009 and indeed won two Oscars and was nominated for four for that year. Daniels was a producer on 2001’s great film, Monster’s Ball with Halle Berry. Clareece "Precious" Jones (Gabourey Sidibe) is 16, obese and her second pregnancy forces the New York district school she attends to expel her. It is 1987 but there are signs of hope and Precious finds her way to an alternative class populated by girls in similar, unorthodox situations. Slowly, with the aid of Ms Rain (Paula Patton) she comes to cherish keeping a daily diary, wherein the spelling and grammar matter little but the act of self-expression is all-important. In our era, where President Barack Obama’s yes, we can! booms proud with hope across the world, Precious peers two decades back into disadvantage, despair and generational hopelessness. It was, after all, the pre-political-correctness age. I think this allows the filmmakers and author Sapphire to present much more grit and grime than could be stomached in our here and now. As if the setting removed the woe and problems from our collective consciences just that little bit. Finally leaving behind the inexhaustible abuse and near-torture from her mother Mary (Mo'Nique, who won the Academy Award for her supporting role and in my opinion almost overwhelms the screen with her embodied cruelty, which later evaporates through understandable yet inexcusable explanation), things start taking a positive shape for the increasingly literate Precious. The birth of a health boy (her first child has Down’s Syndrome) and a growing, caring circle of people help her re-align into life as it should be. Mention should be made of singer Mariah Carey’s slumming-it appearance as a social worker (done), including the “What are you?” question about her ethnicity—a brief moment of sunshine in Precious. But bad news has its own glum gravity and her abusive parents manage to continue their gloomy strangulation. The sound is DTS Master and the transfer is quite stunning, capturing the contrasting lighting of various scenes. The only subtitles are for English Hard of Hearing. Extras are copious and include the Precious Ensemble, a look at the transition from novel to film, a featurette of Oprah and Tyler, a conversation with Daniels and Sapphire, a deleted scene, as well as Sibide’s screen test and to camera addresses from three key filmmakers. I briefly looked through the novel out of interest and I confess it’s not my choice of reading material. However, the movie is one of those must-sees, or at least it should be. If nothing else, it should serve a reminder that on the whole, things could be much worse. But it should also be a call to compassion and an ode to the power of education and the enduring healing of love.